Just wanted to wish you a happy July 4th! Mama said I had to rell you to have a fun and responsible holiday. And if you need a beer, just holler and I'll be right over! Mama says we are taking the rest of the week of from blogging to enjoy time with our friends. I'm just taking some time off to search for hot dogs that have fallen off the grill. tailgate approved! that is awesome! 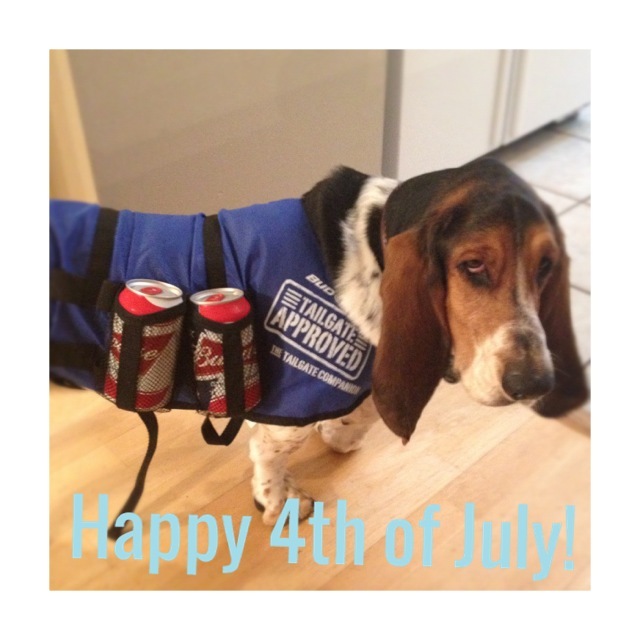 Hope you had a happy fourth! How could you not with the beer gear and hotdogs! Love Floyd's vest, Sarah! Have an awesome weekend! All you have to do is wag your sweet little tail over to Hawaii and Aunt Kait will hook you up.